Laurel Kuehl is Medical Director for Planned Parenthood of the Great Northwest, & works at multiple Planned Parenthood abortion clinics. See documents below. Washington state medical license application file for Laurel Kuehl, MD. State of Washington medical license for Laurel Kuehl, MD. Listings for Laurel Kuehl at Planned Parenthood abortion clinics in multiple cities. List includes: Seattle, Tacoma, Everett, Olympia, Bremerton, Marysville, Puyallup, Federal Way, Issaquah, & Kenmore, WA. Listings for Laurel Kuehl at abortion clinics in Seattle and Tacoma, WA. Listings for Laurel Kuehl at abortion clinics in Seattle, Everett, Olympia, Bremerton, and Belleview, WA. Insurance provider listings. Laurel Kuehl has practice listings at abortion clinics in Seattle, Everett, Tacoma, and Olympia, WA. Kuehl also has (unconfirmed) listings at abortion clinics in Fairbanks and Anchorage, AK. Listings for Laurel Kuehl at Planned Parenthood abortion clinics in Olympia, Bremerton, Seattle, Marysville, and Everett, WA. 2017 insurance provider listings. Laurel Kuehl has practice locations at three Planned Parenthood abortion clinics in Seattle and Olympia, WA. See attached pages. March 5, 2015 -- Laurel Kuehl is medical director for Planned Parenthood of the Great Northwest's Washington area. See page 2. 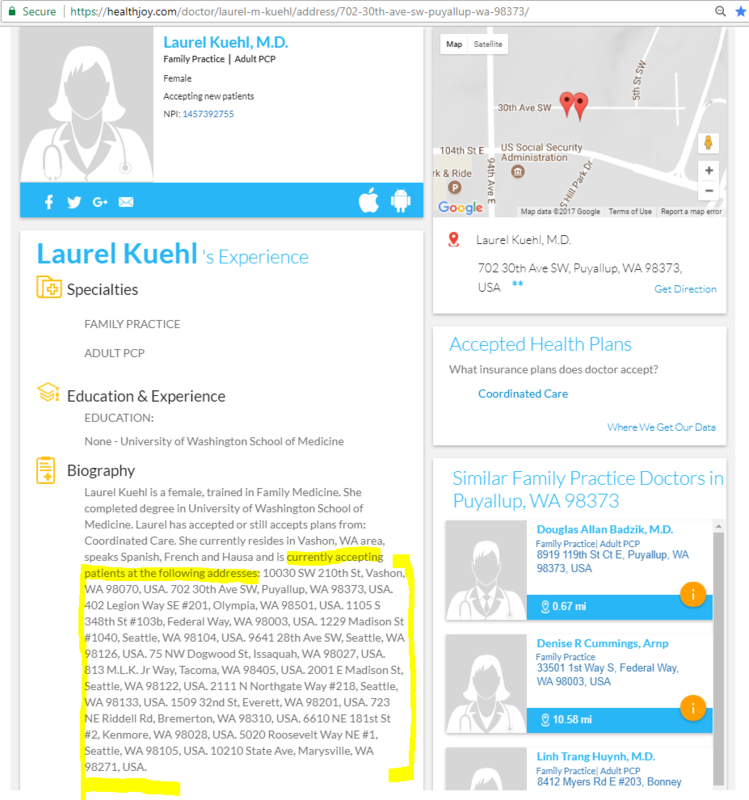 Laurel Kuehl is medical director (note abortion clinic location at 2001 E. Madison St in Seattle, WA). Kuehl was paid a salary of $165,497 in 2014. See page 8.